Truly Texan showcases Texas' finest companies who make or design their own clothes, whether in a Texas theme or not. Pictured below are a few of the Texas t-shirts, Texas caps, & wildflower t-shirts designed or created by the fine artisans of Truly Texan. Click an image to learn more about that shirt, shoe, cap, etc. and how to purchase it. 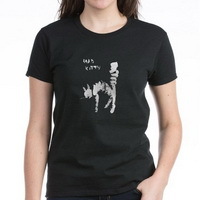 Perfect tee for when you're feeling prickly! 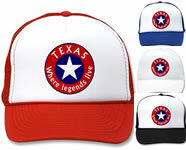 Texas T-Shirt - What Goes On..
"Texas...where legends live" imprinted on a gimme cap in your choice of colors. The Texas furniture, art, gifts and jewelry we feature is available directly from the Texas companies shown here. 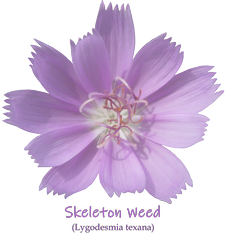 On any item we feature, there will be a link on the detailed description page that tells you how to buy that product. It sends you to the artisan or service provider's website so you can see everything they offer, not just what we show here. And don't forget to tell them you found them at Truly Texan! "Purty" please.